New research has found that trees can help reduce harmful particles found in urban air pollution by more than 50 percent. According to an article by Naomi Lubick of Chemical & Engineering News, a study found that trees capture what’s called particulate matter. Particulate matter comes mostly from car exhaust, road dust and brake pads. When released into the air and inhaled, these tiny particles can contribute to diseases, like asthma and heart disease. 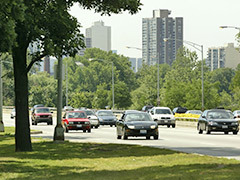 This research supports the need for more trees in urban areas. By strategically placing them in areas where air pollution is heaviest, we can achieve cleaner air and a healthier population. Scientists at the USDA Forest Service Lab in Syracuse, NY have actually outlined additional benefits to having more trees. In addition to removing air pollutants, these scientists make claims that urban vegetation can reduce temperatures, ozone levels and energy use in buildings. One of this research team’s goals is to use its findings to come up with vegetation management strategies and tools to be used in urban areas. Some cities are already creating programs to plant more trees. For one, New York City has implemented the MillionTreesNYC initiative, which has the goal to plant and care for one million new trees across the City’s five boroughs over the next decade. As research in this area continues to grow, we are hopeful that similar tree-planting programs will start popping up in more cities across the country. Posted on December 3rd under Pollution Reduction.